Narragansett Town Hall is located at 25 Fifth Avenue, Narragansett, RI 02882; phone: 401-789-1044. 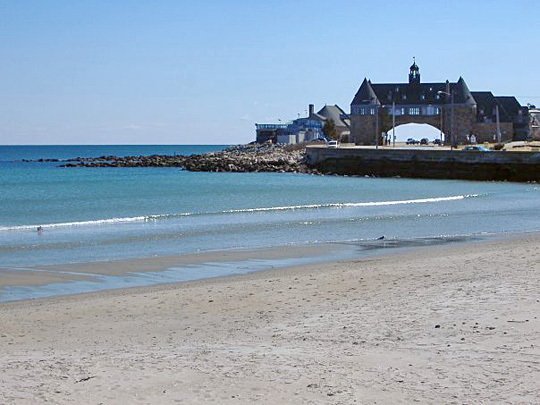 Photo: Narragansett Town Beach, photographed by James Creamer, 2007, en.wikipedia.org, accessed February, 2011. Until the beginnings of the 19th century, the area which was to become Narragansett was sparsely settled and used, if at all, for agricultural purposes. Narragansett Indians occupied what is now southern Rhode Island until defeated in King Philip's War in the 1670s. For many years prior to this conflict, European immigrants had settled in this area, leading the Rhode Island, Massachusetts and Connecticut colonies to fight over control of the land until 1663. In that year a charter from the English government settled the dispute in Rhode Island's favor. The land was divided into farms and by the early 18th century most of the area was owned by William Robinson, a gentleman farmer. When he died in 1751 the lad was apportioned among his 7 sons, one of whom, John, built a pier near the present site of the Towers around 1780 to improve transportation of local agricultural products. The wharf's commercial activity never compared to that at South Ferry, a busy seaport in the 18th and early 19th centuries, which was located several miles north of Narragansett Pier. Charlene K, Roise, Rhode Island Historic Preservation Commission, Narragansett Pier Multiple Resource Area (MRA), nomination document, 1981, National Park Service, National Register of Historic Places, Washington, D.C.